- Are you an electrician? A bricklayer? Or maybe you know someone who is gifted in these areas? We continue to trust the Lord for two men – an electrician and another for brick laying for the team trip in May. Please pass the word along or give the office a call if you would like to join the team. Praise Him for those who have thus far committed to the trip. 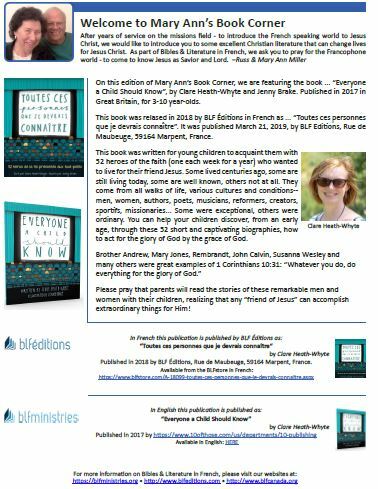 This week we are featuring the book "Everyone a Child Should Know”, by Clare Heath-Whyte and Jenny Brake - now available to minister to the Francophone world from blf éditions as "Toutes ces personnes que je devrais connaître". For more details, click HERE. - Please pray for pastors in Haiti who have received books from BLF Canada. Pray that the books will continue to equip them to minister to their congregations.